You finally muster up the courage to tell your current job that another suitor has captured your attention. OR you are ready to slam your resignation letter on your no good boss’s desk! You were so confident that they would never give you any more money, and that they didn’t appreciate your worth. You lied about your whereabouts to interview three times for your new company. You are out the door and are not looking back. Then your current employer offers you a counter offer for you to remain with them. That’s like your spouse giving you a lavish gift begging you to stay AFTER they said that the situation was “complicated”. Oh, so now you want to appreciate and show you care? 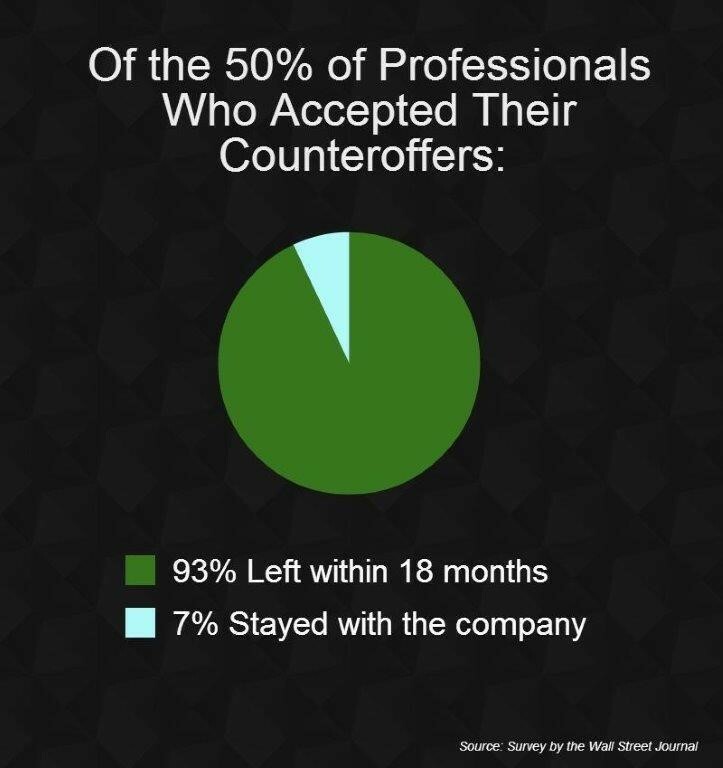 Research shows that 93% of people that accept the counter end up leaving anyway in 6-8 months?? 93% suggests that they wanted to leave anyway, and a counter is only a delay! Here are some things to consider before you accept the counter offer. 1) Do you REALLY want to leave? OR do you just want some attention? 2) Typically a company offers you a counter to stay after you have turned in your notice. Be prepared for them to ask you for a copy of your new offer letter so they can make sure you aren’t lying (you don’t have to show them this). 3) Remember that when you asked for a raise/promotion before and they gave you some bs about budget constraints or additional training? So NOW they have the money? So what was that before? A bold face LIE? 4) Companies never forget! For now they are offering you more money saying please baby please- but after the dust settles they will expect more due to the fact that they gave you more. Also, they will remember your interviews guised as doctor’s appointments and that trust is broken. Who knows when it will return?! 5) On the flip side, this situation could show them that you mean business, that you know your worth, and you won’t be paid/treated any type of way. 6) Even if a company cannot afford the counter they usually have some type of conversation to try and get you to stay if they even give a damn about you. 1) Workplace culture- is your current culture free and flexible? Are you entering a possible chaotic situation? 2) Check out your new company on BBB (The Better Business Bureau), LinkedIn, Facebook etc. What does their digital footprint say about the type of company they are? 3) Hiring manager/HR etiquette. You aren’t the only person being interviewed. Did the hiring manager or HR get back with you in a timely manner? Do they seem like they want you for the job or do you think they are stringing you along while they interview other candidates? 4) Commute and salary. Don’t forget to factor in commute/salary with any new offer or counter. If your current job counters NEGOTIATE! Negotiate more money, PTO, teleworking, or a mixture of both. Just know that they are going to work the HELL out of you if you accept the counter offer. If they are a petty company they may make you pay (in petty office politics bs/drama kind of way) for trying to leave them. Sounds like a shady ex huh? Either way make sure you consider ALL things. If the job pays more but adds an hour to your commute is it really worth it? Lastly, your new position should be an ideal fit all the way around. If you have 10 requirements the new job should meet 8 or 9 of those. DON’T SETTLE! You are wonderful, why should you? · HR Consultation (talent acquisition, Labor Law consultation and more)!